A lush planted aquarium is a wonderful sight to behold. But often many people are held back from getting into this hobby as they perceive it to be beyond the technical grasp of a casual hobbyist. Certainly, it may look difficult at first, but as they say, the biggest hurdle in every task is your mind. And any activity that is worthwhile will involve some degree of initial learning and preparation. But it is our hope that you will find aquaticquotient.com a useful resource of information where a community of new and experienced hobbyists exchange their knowledge and learn from each other. Do note that when you are posting a question, e.g. why is my plant turning yellow etc, forummers can only help if you can provide as much information as possible about your tank's conditions, inhabitants and maintenance. Fluorescent tubes (FL), PL lights (which are compact U-shaped FLs), or metal halide lights can all be used for growing plants, with tubes or bulbs that are "full spectrum" (5500K - 7000K) giving good all-round growth. 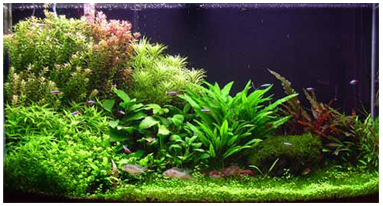 For CO 2 injected aquariums, a lighting output range of 2.5-3.5 Watts per Gallon of water volume is recommended. Thus, a 2 ft tank will do well with two 30W FLs or two 36W PLs, whilst a 3 ft tank can have four 30W FLs or four 36W PLs. A lighting period of 10-11 hours daily is suggested. Good Local Fish Shops (LFS) should stock a broad range of light sets for all budgets. You can also consider fixing up your own lights, and aquaticquotient.com has several discussions on DIY setups in the equipment section. Many LFS stock good systems for CO 2 injection: which should include a compressed gas cylinder; regulator with pressure gauge and needle valve (to control CO 2 injection levels); check valve; bubble counter; tubing and a CO 2 reactor/diffuser (which dispense CO 2 either directly or via the filter outlet). When empty (usually after 6-10 months), many LFS will refill the cylinder for a small fee. Many systems also come with solenoid valves which are connected to the same power outlet as the lights, so that the CO 2 is injected only when the lights are switched on. A cheaper option is to generate Do-It-Yourself CO 2 using yeast and a plastic bottle. You can find the recipe in aquaticquotient.com's FAQ section. The DIY system is not recommended for tanks longer than 3 ft.
Getting the optimum CO 2 level (20-30 mg/l) involves measuring the KH and pH of your water (bubble count is not very helpful). As this is a rather complicated topic, please refer to aquaticquotient.com's FAQ section for articles that explain this method. Most tanks are suitable for plants except for those with filter inlets/outlets on the bottom. A sturdy stand or cabinet is recommended to accommodate the weight of the tank + gravel + water + lights. The heavy covers or hoods that come with some fish tanks sold in LFS are not recommended for plant tanks because they cause the tank to retain heat and get in the way of tank maintenance. Also, they normally do not fit the amount of light tubes required for planted tanks. Overhead filters are not recommended as they take up space better used for lights, and cause surface water movement leading to loss of CO 2 . Internal power filters are suggested for small tanks up to 2 ft long, while there is a large range of power canister filters (e.g. Eheim, Atman etc) available for all budgets and tank sizes. Undergravel filters are also unsuitable for planted tanks. Hobbyists who use very intensive lighting may see their water temperature hitting 30°C or more. Most plants do best at a temperature of 25-28°C, so AC/DC fans can be used to cool the water. A more expensive option is to use chillers. The equipment forum contains several interesting discussions on cooling options. The Nitrogen Cycle refers to the process by which fish waste is turned by bacteria into Ammonia (NH 3 ) to Nitrite (NO 2 ) to Nitrate (NO 3 ), which is absorbed by the plants. In the first few weeks of a new tank, there is usually insufficient bacteria, so ammonia levels rise quickly, causing fish deaths and algae outbreaks. This is why we recommend you do not put fish other than a few algae-eaters in your tank until the nitrogen cycle is established. Most fish species are suitable as long as they will not dig up or eat plants. Actually, the fewer species you have, the better the effect. Just look at the tanks by Takashi Amano ( www.vectrapoint.com or in the Nature Aquarium/Aquajournal series available in good bookshops and LFS). For help in plant selection, please refer to the online flora databases at aquaticquotient.com , or www.tropica.com ,or www.dennerle.de . We hope these tips will start you off on the right footing to an exciting and rewarding hobby, and look forward to sharing more with you at www.aquaticquotient.com !